eCommerce retailers are already taking advantage of cookies (not the delicious kind), to track shoppers through their online store. Most e-tailers are using data to target people who have abandoned their shopping carts by placing the shopper’s chosen products in ads around the web, and sending them newsletters and offers for products they are likely to be interested in. If you have the right tools, you can capture more details on product purchases and preferences, giving you the insights to run more targeted and effective promotions. Collecting all this information is easy in Vend, and there are a couple of tools you can leverage to put the data in to good use. Collect, a cloud based loyalty and marketing software that integrates with Vend, allowing you to gain detailed insights into your customers’ product preferences. You can then use that information to segment customers and send out targeted and relevant offers, based on the insight you gather. MailSync, which automatically syncs your Vend customer database and eCommerce database into popular email marketing apps, allowing you to maintain an up-to-date mailing list. Do note however that the information you can collect is limited to basic data, such as name, email, phone, and address. A loyalty solution that is quick and easy for the staff to operate at point-of-sale is the way to go.Collect’s loyalty solution integrates with Vend, making it easier than ever to add a customer to your database. 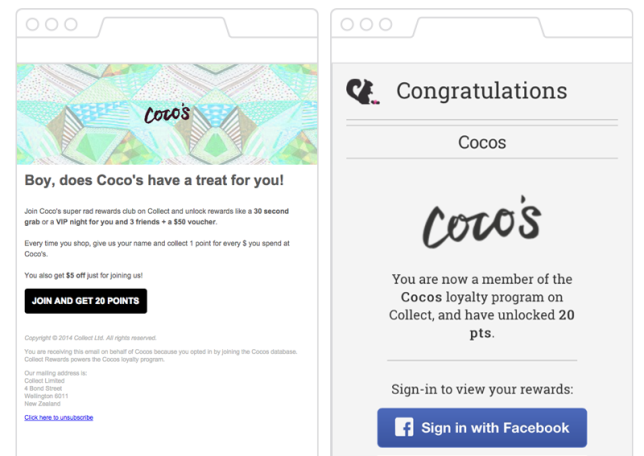 Collect even sends the customer an email to join through Facebook, giving the store access to more demographic information, and a profile photo – which is handy for identifying them on their next visit. 2. Build trust. When asking for personal information, let your customers know what you are using it for – whether it’s to join your loyalty program, mailing list, or to send them exclusive offers. Only use shopper data to help you better serve them, so it’s beneficial for the both of you. Seventy-three per cent of consumers are happy to have their buying behavior monitored in return for personalized offers. 3. Give your customers a reason to hand over their details. Consumers are willing to let businesses access their personal data when given an incentive, such as additional savings, a reward, or better service. A great way to do this is by offering an instant sign-up bonus – which could come in the form of a small gift, a discount on their next purchase, or bonus points on your loyalty program. A pretty awesome example of a compelling reason to join a loyalty program is Bird On A Wire’s (BOAW) sign-up bonus. BOAW is a delicious destination for the best free-range rotisserie chook and seasonal salads in Auckland, New Zealand. They offered customers half a chicken when they joined their loyalty program, which Ben from BOAW said “was enough to get people pretty excited and also gave us an opportunity to showcase our key offering”. 4. Consolidate your databases. If you have a brick-and-mortar store, an online store, a mailing list, and a loyalty program, you’ll be collecting data from a number of different sources. Consolidate them all into one database to make sure no one gets a double up of accounts or marketing communications, or misses out on your messages. There’s no point collecting all that information unless you plan to do something with it. 1. Send birthday offers. Let your customers know you are thinking of them on their special day. It’s a great way to strengthen loyal relationships and doesn’t have to be anything too extravagant. Just a little something to show your customers that you appreciate them. Consider for instance, what WooGo Juice, a Smoothie bar in Taipei is doing. 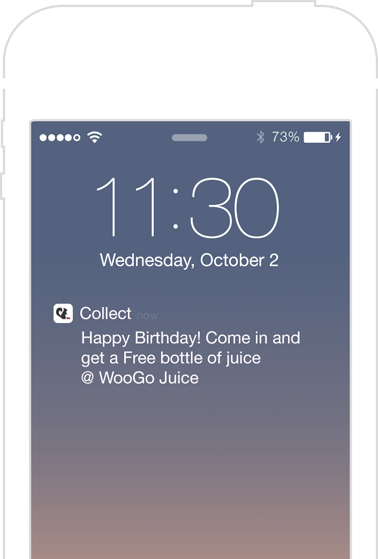 To increase loyalty with patrons, the retailer sends customers a free bottle of juice on their birthday, automatically with Collect. 2. Send email campaigns. Use the data you’ve collected to segment customers and send more relevant and effective email campaigns. You can, for example, send the men updates on your men’s products and the women updates on your women’s products. Makes sense, right? And, the more data you collect, the more targeted you can be. For example, Urban Outfitters sends newsletters based on customer purchase history. This email below for instance, was sent to men who had purchased a jacket previously. Use the data you collect to identify your best customers and find ways to engage them further. 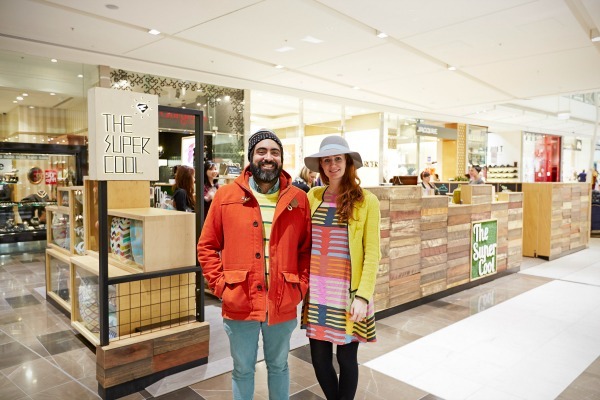 One example of a store that has gone all out with this is TheSuperCool, an emporium of everyday objects that brighten up customers’ homes. The Melbourne-based retailer uses Collect to reward their most loyal customers by inviting them to private shopping experiences. Customers can bring their friends and receive personalized styling advice from the store’s creative director and co-founder, Kate Vandermeer. They even get to enjoy drinks and nibbles on the house. Not only that, but TheSuperCool also gives away a $100 voucher to each attendee, plus $50 vouchers for 3 of their friends. 4. Offer product suggestions. Use the information you’ve collected on your customers’ product preferences to send them offers on their favorite brands or items to get them to come back to your store. For instance, if you know that a customer loves Brand ABC, and you have some new arrivals from that company, then why not send that shopper an email showcasing those products to entice them to come in? 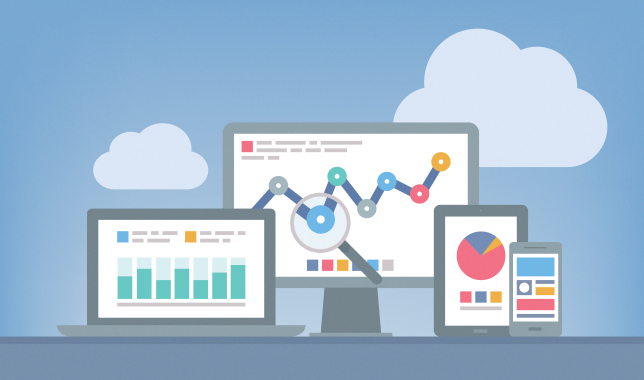 Collecting data can seem like a big task, but it doesn’t have to be. Once you have the right tools, you’ll find you can actually automate the process and gather intel more effectively. Using Vend and Collect is a great starting point. Not only do these solutions allow you to collect data, they also give you the tools to set up targeted marketing campaigns and automated offers.